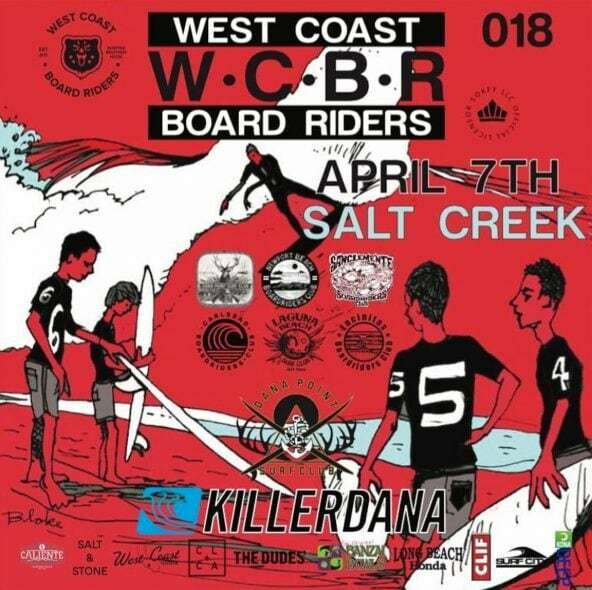 The West Coast Board Riders is a multi-generational surf organization that consists of regional clubs that are anchored in beach cities in California from Santa Cruz to Carlsbad. Dana Point recently formed a club that competes in the South Division. On April 7th, 2018 the Dana Point Surf Club will host an all-day surf competition of the South Division at Salt Creek. This is a family-friendly fun competition and is highly competitive as former and current pro surfers are eligible to compete. Come to Salt Creek to show your Dana Pointer pride! Attended elementary, MS, HS or College. Direct inland areas count if they surf hometown on a regular basis. Each surfer gets one chance to “jump” clubs. But, once you jump and surf for another club, that is final. WSL Judging criteria and interference rules. 4 teams, 4 surfers per team, 1 hour heat. One surfer at a time from each team in the water. First surfer starts heat in designated tag area (Beach start). Next surfer must be tagged in designated area. If tagged outside designated area, Team gets 1 point deduction. Last surfer per team must be in the tag area by end of heat or get a 5 point deduction. 3 wave maximum per surfer, Best one scored. Each team has one “Double Whammy Surfer” (DWS). DWS must raise both hands up within 10-15 seconds after his wave to be rewarded DW points (double points).